Sorry Blindspotters! I'm the worst. Life got away from me these past few days, but I finally found the time to watch "Regard a Mere Mad Rager" and whoa. Boy, do we have a lot to talk about. So let's dive right in! The case of the week focuses on the serpent tattoo, which is located in a very conspicuous location. Kurt Weller, are you blushing? The tattoo leads to a hacker named Serpent 16, and Patterson is very worried. Hackers wanted by the FBI tend to keep a low profile, so she's concerned Serpent 16 could be targeting a local network to inflict maximum damage. Good to know. Team Blindspot should stop that. The team follows Serpent 16 to a dead drop and he picks up a package. But someone else comes along and kills Serpent 16. Then that man is shot and the gunman takes off with the package. It's like a really violent game of Hot Potato. Good times. No... really. It was exciting. I want to play again. Inside the package is a Rubix cube, which is just another step in a large scavenger hunt hosted by the Garen brothers who are the creators of Leakhub (Blindspot's version of Wiki Leaks). Whoever wins will be named their successors — which means access to a lot of classified documents. 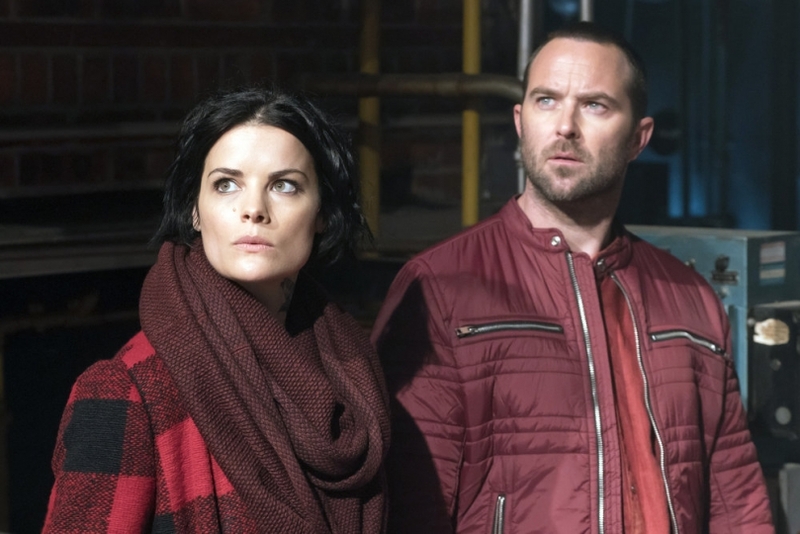 Team Blindspot wants in because one of those classified documents is labeled "The Truman Protocol," and it holds the key to Sandstorm's plan. Kurt nominates himself and Jane to go undercover as hackers. The side-eye he elicits from Zappata and Patterson — the only real hacker on the team — is comedic gold. Careful, Kurt. Your feels are showing. But if Kurt and Jane don't go undercover together they can't be forced into a polygraph to share their innermost thoughts and feelings about one another! Priorities, Patterson. The Garen brothers... err, sisters it turns out... (nice thumbing your nose at misogyny, Blindspot!) care a great deal about true partnership. They want their successors' partnership to be as bonded as theirs. This all boils down to Kurt and Jane acknowledging some of their feelings for one another (*joyful squealing*), but let's save that for their section of the review. In the end, Kurt and Jane secure the files because they are the most moral of all the competitors (they didn't leave their competition to die). In a nice twist, the other team who almost won were Sandstorm plants. Unfortunately, The Truman Protocol is heavily redacted and, once again, we are left with little to no answers. Sigh. "Why make things so convoluted?" is a line of actual dialogue. Look, even Blindspot is acknowledging their level of ridiculousness as of late. I wouldn't have an issue with the convoluted plots to the tattoos — that's part of their charm — if those plots actually resulted in some answers and moved the storyline forward. Once again, I'm afraid we are headed toward a Blindspot information dump. All the answers will be provided in one or two episodes. It makes the show feel like it's permanently revving their engines in neutral, which isn't entirely interesting television. Reade came back to the FBI to ask for his job back. Well, sort of. He wants to take Kurt up on his original offer of a leave of absence, and apologize for being such a jerk about it in the first place. Kurt is well... Kurt. He's stern but understanding. He never reported Reade up the chain of command; and if he cleans up his act then Kurt won't have to. Awww. I've missed their bromance. Unfortunately, whether or not Reade returns to the FBI is a bit of a question mark. It seems firing a gun sets off his PTSD flashbacks, so the psychologist wants him to consider hanging up the badge. Jane is the entire Jeller fandom. She's just so darn happy to be back in the field, working with Kurt, that she's practically skipping down the street with him. Girl, we feel you. This also seems to be the perfect time to ask Kurt how he feels about Nas leaving. Honestly Jane, just slide him a piece of paper with, "Do you like me? Check yes or no" on it. I think it would be more expedient than this line of questioning. The real Jeller goodies are during the polygraph, since Kurt and Jane like to keep their feelings bottled up. Although, I'm a little surprised the answers recorded as truthful, since they were making up the circumstances. But whatever. Let's not dwell on the details. But then we get to this, which we WILL dwell on: "Yes, I lied to my partner and yes it was about something important." OKAY. HERE WE GO. As you all know, I'm so over this "Jane lies to Kurt" plotline. We've done it. Many, many times. Let's find new ground, writers. (It also taints my hope for their reconciliation because no matter how much Jane cares for Kurt, she's still LYING to him. It bugs me.) So consider my joy when Jane confirms she's lying to Kurt. Then consider my irritation when, YET AGAIN, it doesn't get addressed later on. My imagination can stretch a fair ways, but are we really saying Kurt wouldn't bring up Jane lying to him at the bar? Umm... no. This is Kurt "Tell Me The Truth" Weller. We've spent the entire season watching him bemoan Jane's lack of honesty and trustworthiness. Now, he's suddenly decided to change his mind and talk about feelings instead? Character consistency is a thing, Blindspot. You can do better. Instead, the show goes directly to an almost-kiss, which is very buzzworthy, but I have a hard time enjoying it because Kurt and Jane still aren't addressing the lie between them. I don't think Roman killing Taylor Shaw's mother is going to be a deal-breaker for Kurt. Not in terms of Jane. I feel confident that after this season, Kurt can forgive Jane just about anything and I think he'll understand her need to protect her brother. So... can we just be done with it already? Let's just get the cards out on the table, deal with them, forgive and move on. Then I can experience pure joy as Jeller makes out. All right, that's enough Debbie Downer from me. Let's get to the good stuff, because there is a lot of good stuff. "I use to put a lot of walls up. She somehow found a way to get inside them." This is Kurt's answer for the best and worst thing Jane has ever done for him. I really can't think of a better way to sum up the crux of Kurt's issues with Jane. He loves her. He trusts her. And that's what hurts so much. Kurt's love and trust for Jane created a blindspot. And, more than anything, he's afraid that will happen again. I think an important part of relationship growth is understanding that we can never know EVERYTHING about someone. We are never 100% honest in a relationship. Everyone has something they hold back or don't say. Obviously, Kurt's issues with trust go much deeper than that with Jane, but I do think Kurt being open to a relationship with Jane again (see: almost-kiss) means he believes he knows the important stuff about her. She's compassionate, kind, loyal, and selfless. Jane may keep things from Kurt, but there is always good intent behind her lies. Make no mistake, truthfulness is an area Jane needs a great deal of improvement in, but Kurt being able to keep a clear perspective on Jane is important too. The issue then becomes about whatever Jane has lied about rather than about who Jane is as a person. Essentially, Kurt's love for Jane created a blindspot last year and his anger at her created another one this year. Kurt is figuring out how to balance her as a whole person. She is neither saint nor sinner. She is a human being who makes mistakes. I think it's an important distinction and gives Kurt a more realistic view on who Jane Doe really is. "I chose to work with my partner because he was honest, loyal and I trusted him with my life. As for him, he didn’t choose to work with me. He was forced to," Jane says. As for Jane, she feels like something forced on Kurt. Remi used Kurt's love for Taylor Shaw to insert herself into his life. However, once she lost her memories and became "Jane," she fell in love with Kurt. There's an infinite amount of guilt for the way Jane came into Kurt's life and the havoc she wreaked upon it. Kurt is a choice for Jane, but she fears she's someone Kurt is just stuck with. If given the option, he wouldn't choose her. "All of this led me to you. And you to me. And that is something I would never want to undo." When Kurt refutes Jane's fear it, is monumentally important. Despite all the lies, hurt, anger, and distrust... he wouldn't change anything. Kurt Weller would choose to do it all over again because it gave him Jane — and she is everything to him. I think Kurt saying this to Jane is almost more important than saying, "I love you." This forgives Jane for how she came into Kurt's life, which is something I think Jane craves even more than his love right now. Jane is Kurt's choice as much as Kurt is Jane's. There's a security in that knowledge. No matter what happens, he would choose her all over again. Jane needs this security in order to be honest with Kurt. Once Jane realizes she won't lose Kurt's love every time she makes a mistake or finds out information he's not going to like, then I believe it will be easier for her to be truthful with him. However, someone has to blink. Someone has to make the first step. It could be the reason Kurt didn't press Jane about the lie. In the end, whatever she's lying about doesn't matter. Kurt understands that if she's lying about something, it's because she has a good reason to. A reason that is based on Jane's goodness and compassion. At the end of the day, Kurt knows who Jane Doe is. He loves her. That will never change. If he has to choose a life with Jane Doe or without her... life with Jane Doe wins every time. So instead of pushing for answers about the lie, Kurt chooses to tell Jane his truth. He blinks first. But now the ball is in Jane's court. She has to be honest with Kurt about Roman and trust Kurt will be there when it's all over. Otherwise, whatever Kurt and Jane are building will eventually collapse again. When Kurt and Jane fighting the other hackers, I wondered, "Are all the hackers ninjas?" So the whole Sandstorm hacker team really cleared up a lot of confusion for me. Mama Sandstorm tries to make a deal — which goes south because of Team Blindspot. She's arrested. Thanks, Blindspot, for showing real consequences to running around Bangkok with guns. “Don’t explain; just type.” KURT WELLER, YOU ARE MY SPIRIT ANIMAL. "At least we weren’t on the turquoise team." Jane made a joke. She's partners with Kurt again. There's birds singing, laughter in the air, and sunshine in the sky. ... But extreme fail on those outfits. Everyone in the mob just happens to be wearing the exact same shades of red and patterns as Kurt and Jane? There's a certain style hackers wear? No. I can roll with a lot, but I'm gonna hard stop right there. I hate word problems. I have a complex about them. I really like Zappata’s hair in a ponytail. I know I've mentioned this before, but it's really important to me so I'm going to mention it again. “Prove you can trust each other and you’ll find your fates will forever be entwined.” Garen is a Jeller shipper. Come fight me. Shepherd wants Kurt to die but we don’t even know why he was needed in the first place! So irritating. Can we know at least ONE of the plans before you decide to change them, Blindspot? Hi Jen, thank you for your review! I agree with all that you said (and like you I'm feeling frustrated at the lack of answers about Phase 2), but for one thing: Kurt knowing that Jane's lying to him and not pushing the matter. But English is not my native language so maybe I understood it wrong? Anyway, when Jane said "Yes, I lied to my partner and yes it was about something important", I understood it as her saying she lied, not she's still lying. And for me, Kurt thought that she refered to the whole season 1 storyline about her getting in bed with Oscar and doesn't know that she's still keeping something from him. But either way, I totally agree with you that Kurt opened the door, she has to come clean and soon. That was my take away as well. She used past tense which, given Weller's current state of trusting Jane, probably did not alert him to the fact that she is still lying.